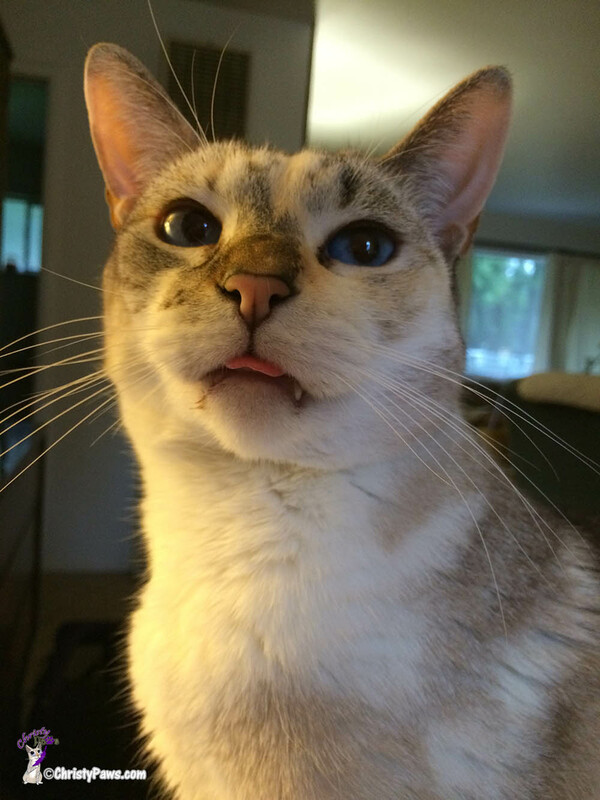 « Have You Heard of Whisker Fatigue? Mom thought she had a great idea for today’s Caturday Art. Since she has several photo apps, she thought she would take the same photo into each app, apply the same effect and compare them. into PhotoLab. Water color is her favorite medium so she decided that is the filter/effect she would apply in each app. Here is the result from PhotoLab. Next, she took the original photo into Camera360 and discovered it has no water color filter or effect. OK, she thought, every app must have a painting effect so she that’s the filter she used in Camera360. Back to PhotoLab for the painting effect. Next she tried piZap which had neither a water color or painting filter or effect so no sample from piZap. By then, she was getting a little frustrated that her idea wasn’t working out as planned but she tried one more app – SuperPhoto. SuperPhoto didn’t have a water color effect either, at least not called water color, but everyone seems to love this app’s painting effect, including mom. Wow! They are all really different. Although it is the least painting-like, I think my favorite is the one from Camera360. Do you have a favorite? How did other aspects of the photo apps compare? During this little experiment, she also learned that since each app has different ways of applying the effects, some are much easier to change from one effect to another. PiZap was the easiest and PhotoLab the most difficult. PhotoLab and Camera360 both have easy crop functions with preset sizes, making it easy for a square crop for Instagram. You can crop in SuperPhoto but it is a drag-to-size kind of crop. Each app downloaded or saved the photo in a different size. Camera360 definitely saved the highest pixel size by nearly 5 times that of SuperPhoto which was the smallest. None of the photo apps were perfect. Each app had its pros and cons. 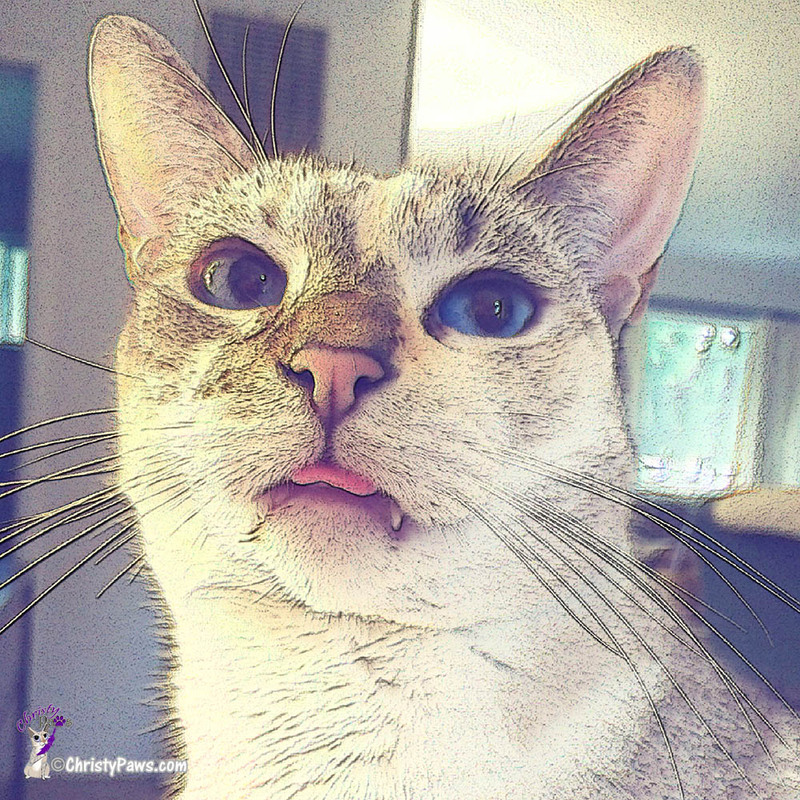 Since mom mostly uses Photoshop, she doesn’t spend a lot of time with these apps, but she does like some of the effects that are easier to achieve than in Photoshop. Mom would like to know what your favorite photo app is and why. Please, please tell her and help ease her frustration! 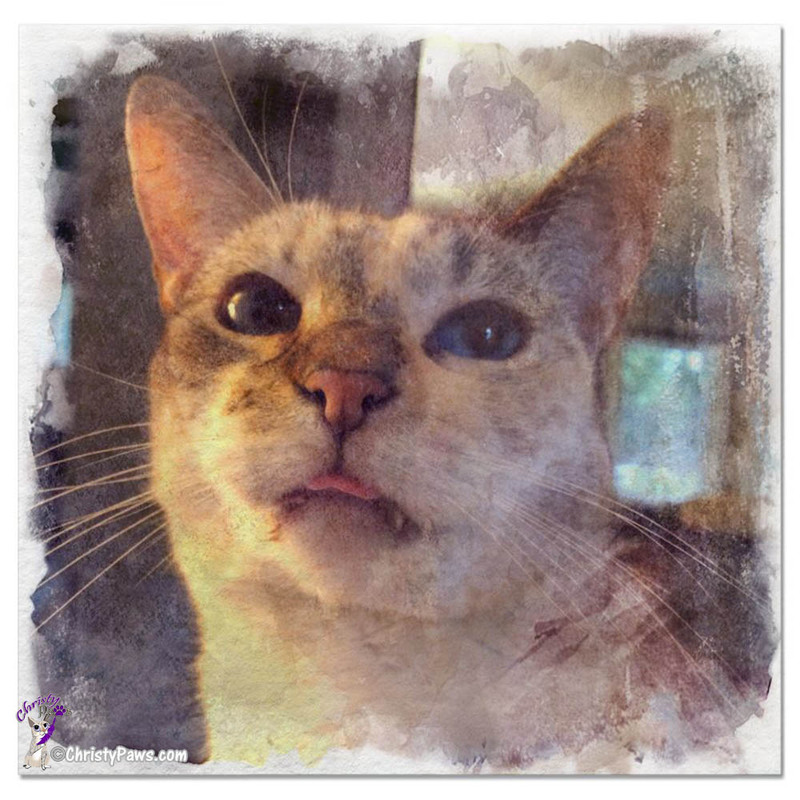 Tagged blog hop, cat, cat photos, Caturday Art, Christy, digital art, photo apps. Bookmark the permalink. Those are all amazing.. Our current fav is SuperPhoto and BeFunky. But for a more professional look and for anything that I will post for sell on Zazzle, etc, it’s PhotoShop. 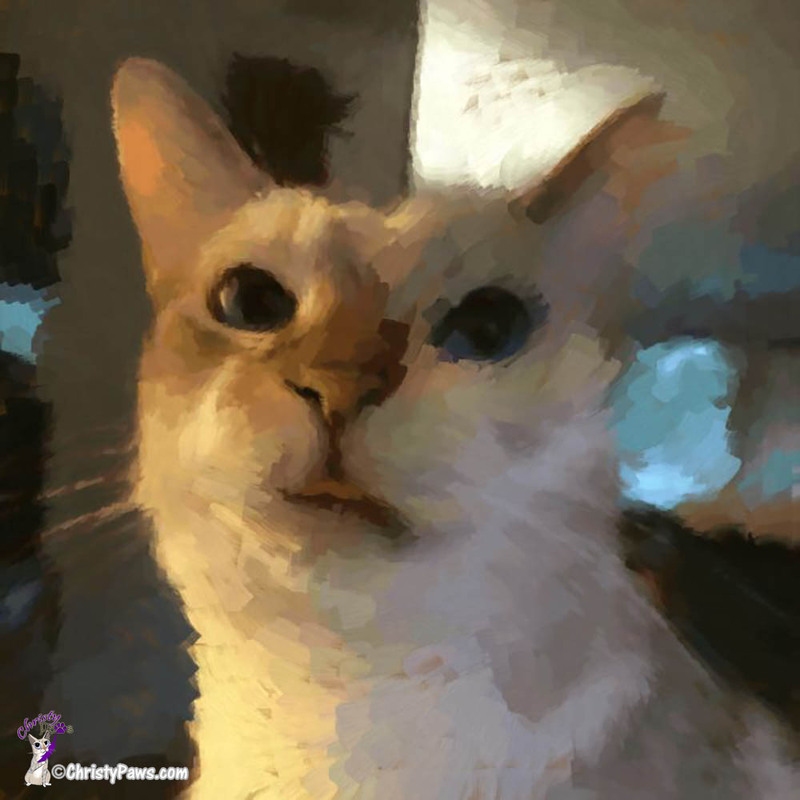 My human has a ton of painting and digital art apps… none of which she has used in a while! She has one for her iPhone called Sketch – it’s a sketch, not a painting app, but for a sketch effect, it’s her favorite. I think you are perfect in your first photo. WE found your experiment quite interesting. We mainly use PicMonkey because it’s so easy. I like the Camera360 effect best but I’ve never used that or PhotoLab. TW uses Photoshop a lot but we’ve used Superphoto, PicMonkey, Pizapp and many people are recommending Canva but we’ve never used it for photo editing. Great review, Christy, And great pics, too. Mommy doesn’t use any of those apps, but she should start. They all turned out so cool but yes, the Camera360 just might be our favorite. 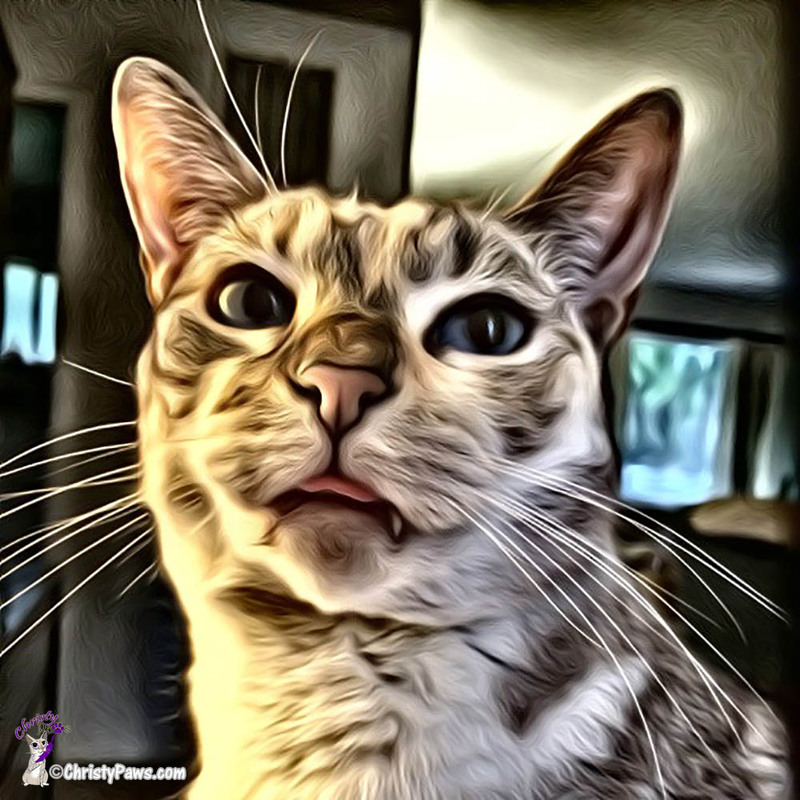 We are just nuts about the Super Photo app…just love the neat artwork that can be achieved with just the click of a mouse! They all look darn good to us! We don’t use many apps either, just PhotoShop like you do! I think they are all great even if your face is dirty. I did prefer the last two though. It is my “go to”……….I use other apps (some that you have mentioned) but always go back to ribbet……I absolutely LOVE it! I’ll have mom check it out. Thanks!